When you head into the emergency room, you might assume that the doctors you see are hospital employees who accept the same insurance plans as their employer. But nearly two-thirds of hospitals now staff their ERs with freelance physicians who might not accept your insurance plan, meaning you’ll be on the hook for whatever your insurer doesn’t pay. In addition to the potential added financial burden, some patients now have to drive far out of their way to find an ER that won’t hit them with a surprise medical bill. Melanie*, who lives in California, is one of these patients. After a series of surprise bills from out-of-network ER doctors at otherwise in-network hospitals, she realized the only way to avoid the unexpected sticker shock was to look outside her area for emergency care. As we’ve discussed before, “balance-billing” is the practice by which out-of-network doctors will bill patients for the balance that remains after the insurance companies pays out its contractually obligated amount to the hospital. In California, your protection against balance-billing depends on which type of plan you have and who regulates your insurer. Consumers covered by HMOs and PPO insurance plans licensed by the California Department of Managed Health Care are protected from balance-billing for ER visits. But if the PPO or any other insurance plan is regulated by the California Department of Insurance, state law does not protect an ER patient from balance-billing. This inconsistency in California law leads to some patients erroneously being billed for balances that their HMO should be negotiating. But if you’re like Melanie and your plan is not exempt from balance-billing, it’s up to you to either pay up or try to work out a deal with the doctor. And in Melanie’s experience that drawn-out, tedious task has led to significant changes for her family and their medical care. In the cases where Melanie and her family do have a choice, they now bypass their local hospital – which is about 10 minutes away – for one that’s about 30 minutes away. While that might not seem too far out-of-the-way for a doctor’s visit, any additional drive time — which can vary greatly due to finicky California traffic conditions — is a cause for concern in a medical emergency. When the family was on a trip last fall, Melanie suffered a concussion. Because of her previous balance-billing experience she knew to call the closest hospital to see if doctors were in-network. They weren’t. Melanie and her family ended up driving two hours to a smaller healthcare provider with in-network physicians. While Melanie has been lucky to have the time to check in advance to find out if her insurance will be accepted, many medical emergencies are time-sensitive, leaving little room for patients to call around and inquire about coverage. Our colleagues at Consumers Union, who have an online portal through which individuals can share their medical-billing stories, have already heard from more than 1,600 individuals with personal stories related to unexpected, out-of-network ER charges. Most of these cases occurred during emergencies where time was of the essence. But whether the end result was a quick stitch-up or a complicated surgery that required weeks in a hospital bed, these stories nearly always ended the same: with a hefty and unexpected bill. • Lillian, from South Carolina, was taken to the hospital in September after suffering a seizure at work. At the local ER, which was in-network, she was given a battery of tests and seen by several doctors, one of which was out-of-network. But because she was taken to the hospital during an emergency, she had no way to know that one of her doctors wasn’t covered by her insurance and no one informed her before being seen by the particular physician. Shortly after the visit, Lillian received a nearly $800 bill for the doctor who she says was only in her room for a short time. 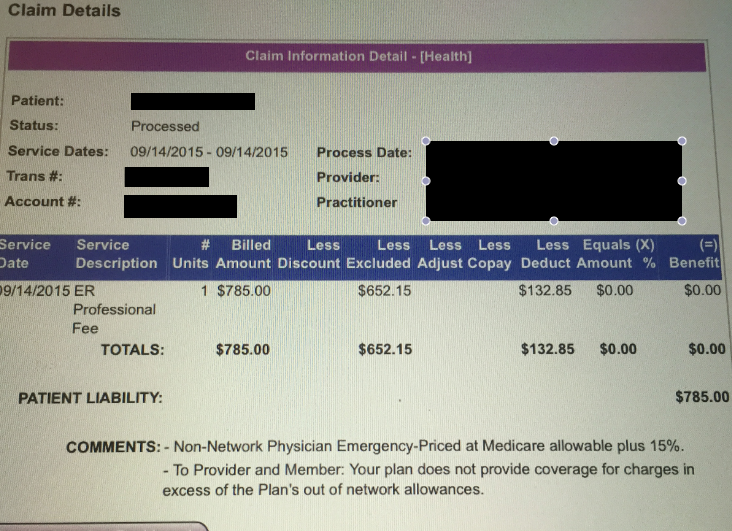 Lillian provided Consumerist with a screenshot of her recent surprise medical bill. She has yet to negotiate the cost with the out-of-network doctor. As with other patients who receive out-of-network bill from ER physicians, Lillian is responsible to cover the costs. • Peter, from Orlando, says he received a $735 bill for an out-of-network physician after a recent visit to the ER for severe chest pain. Unlike Lillian, who was only in the hospital for a short period of time, Peter’s stay lasted six days and included surgery. While all his other costs were covered as he’d expected, daily visits from one out-of-network doctor resulted in Peter’s surprise bill. • Across the country in Texas, Pamela says she specifically asked the ER if her plan would cover everything before her husband was seen. While the hospital assured her they were considered in-network through her insurance, she later received a $1,000 surprise bill from an out-of-network physician who treated her husband. “This is such a ripoff because the hospital knew its providers were not all in-network,” she says. Although the bill was far more than Pamela was expecting to pay, she says the experience taught her to do her own research. The likely cause for Melanie, Lillian, Peter, Pamela and thousands of others’ hefty out-of-network ER bills comes down to the changing medical landscape and the contracts that come along with it. According to the New York Times, nearly 65% of hospitals contract out ER physicians — often through physician networks. Because these doctors are brought on as independent contractors, it’s often up to them — or the physicians group through which they are contracted — whether or not they choose to accept the same insurance plans as the hospitals in which they work. Chi Chi Wu, an attorney with the National Consumer Law Center, says this is an issue that advocates have seen more of in recent years, with physicians at times deliberately refusing to negotiate plans and then driving up consumer costs. One medical billing expert tells Consumerist that negotiations often, but not always, work when insurance companies propose a contract that will include payment rates in response to a provider’s request to become or stay-in network with them. The provider can then accept or reject the contract, or keep negotiating. When they aren’t able to keep working on a deal, the doctor is not covered by that provider and patients under that plan are then subject to the out-of-network costs. These sorts of negotiations aren’t just happening with ER physicians, they also occur in a number of other medical specialties. But unlike other types of physicians, who sometimes schedule patients out months in advance, ER doctors are in a particular position of having a captive audience that often hasn’t had the time to research whether an individual doctor will or won’t accept their insurance plan. According to a 2014 Center for Public Policy Priorities report [PDF] on balance-billing in Texas, researchers found that ER physicians accounted for the highest share of out-of-network billing at in-network hospitals. Nearly half of Texas hospitals that accepted United Healthcare insurance had no in-network physicians working in their emergency rooms, according to the report. More than two-thirds of the ER billing at these hospitals was for out-of-network doctors. More evidence of surprise emergency room bills surfaced earlier this year in Hawaii, where several patients shared stories with Hawaii News Now of receiving hundreds — sometimes thousands — of dollars in bills after one particular physicians network, Emergency Medicine Physicians [EMP], and their insurance provider, Hawaii Medical Assurance Association [HMAA], failed to agree on contract terms. In response to the public outcry and media reports, the two entities eventually came to an agreement and announced HMAA would re-process all claims with EMP for patients affected by the initial contract termination. While it might be easy to place the blame for failed negotiations on insurance companies’ and physicians’ greed, Mark Reiter, president of the American Academy of Emergency Medicine, tells Consumerist that this simply isn’t the case. Reiter contends that a vast majority of freelance ER physicians currently in hospitals are in-network and only view going out-of-network as a last resort. But he does acknowledge that these out-of-network docs do exist, likening the negations to a David versus Goliath matchup. Making matters worse, Reiter says, some of the physicians groups often deal with five, 10 or 15 insurance companies at a particular time, making it difficult to simply settle on less favorable terms. “Physician groups are heavily motivated. They want to be in-network,” Reiter says. The positive resolution of the cases in Hawaii is not typical. More often, patients are left with few options other than pleading with the doctor and insurance company to reach a deal. As Melanie told us earlier, she has had some luck finding out in advance about a doctor’s in-network status, but it often just comes down to the luck of the draw. Finding out that the doctors are in-network before heading to the ER can be difficult for two reasons. First off, in most cases the need to visit an emergency room is, well, an emergency and patients may not exactly have the time to call around while they are bleeding, feverish, concussed, or otherwise impaired. When Melanie dislocated her shoulder while in Southern California, an ambulance was called. Other times she’s tried to find out the status of coverage before being seen in an ER and was shot down. She attributes hospitals’ potential liability for their general reluctance to be transparent. And even if an insurer or a hospital is able to provide information before heading to the ER, it’s not always foolproof. That was the case for Melanie when she was on a business trip a few years ago. The provider told her to go to a certain hospital. Unfortunately, the physician she saw wasn’t covered and the visit ended with another hefty bill for Melanie. Another option for consumers is to determine whether or not their situation really constitutes an emergency. The difference could mean thousands of dollars in medical bills. Some insurance plans make special accommodations for emergency visits — they’ll cover the costs no matter the hospital or doctor’s in-network status, but if the insurer believes that an ER visit wasn’t really a medical emergency, it’s not as likely to be so generous. Under the Affordable Care Act’s “Prudent Layperson” Standard, a medical emergency is defined as a condition with acute symptoms of sufficient severity that a person who possesses an average knowledge of health and medicine could reasonably expect the absence of immediate medical attention to result in: placing the health of the individual, or their unborn child, in serious jeopardy; serious impairment of bodily functions; or serious dysfunction of any bodily organ or part. Unfortunately, insurance plans may not see each visit to the emergency room as meeting this standard. When that happens, most health plans will only pay the amount listed for out-of-network providers, with the balance of the doctor’s fee becoming the obligation of the patient — and another surprise medical bill is born. Eventually, her insurance company went through the lengthy appeals process; letters were exchanged and the issue was put to rest, although she still ended up paying nearly $100 in extra costs. In all of Melanie’s experiences, she’s learned a few things she thinks other patients might find helpful. Additionally, while fighting the bills can be “very complicated and tiresome,” it’s sometimes the only recourse. *Per her request, we have not used Melanie’s actual name.